As I was writing up a new epilogue for a book I’m working on, I was reminded of some of the criticism I’ve seen directed towards epilogues and prologues lately. Apparently they’ve become A Bad Thing, though I don’t know when this happened. I’ve seen a few agents, editors and other publishing types bemoaning manuscripts sent to them with a prologue; one suggested she trashed any book that happened to have one. This seems like an overreaction to me. True, prologues and epilogues, which are little scenes set outside the main story that serve to get the book started and bring it to a close, can be either ghastly, dull or both. But done right, they can serve an important purpose. Personally, I love them. I use them for all kinds of things, and they play lots of different roles in the stories I write. A good prologue has a lot of purposes. One of them could be to set up potential conflicts, give a (reasonable) amount of background or establish a setting. The prologue in Romeo and Juliet does all of those things. In a very short space, the audience now knows what the setting and major conflict are. This prologue also basically tells the audience exactly what will happen: they know they’re watching a tragedy from the outset. This changes how people experience the play, though it doesn’t stop them from wishing it could all come out differently this time. The entire mood of the play would be vastly different without the prologue. This is part of what the prologue in THE SPARK does. One of the characters commits a terrible act of betrayal, and the prologue sets this up. When we see this character later on, it’s with the knowledge that she’s about to betray her friends. We also have some context; her betrayal, when it comes, doesn’t happen in a vacuum. We know why she does what she does. The prologue in FLY INTO FIRE vividly describes the destruction of Union Tower, which creates a somber, tense mood that bleeds into subsequent chapters. It also affects our view of Sky Ranger, since this event is something he’s trying to find some way to either outrun or accept for the entire book (and, really, for the rest of his life). Lastly, prologues can be used to set mood. I’m experimenting with adding a dreamy, rather abstract prologue to something I’m working on now, which contrasts with the initial feel of the first part of the book. But it does set up some of the more dreamlike and fantastic events that happen later on, which I like. Epilogues, on the other hand, are all about putting a cap on what’s just been read. The epilogue at the very end of Harry Potter’s seven book epic is a nice example (I’ll let you look it up. Don’t pretend you don’t have the book lying around somewhere). The epilogue here does a couple of things to put a period at the end of the series’ sentence. First, it establishes a return to normality and the continuation of the very things the heroes fought for. The scene is set at the train station, waiting for the train to Hogwarts, which both reinforces that normality while passing the torch to a new generation. It also extends the arc of the major characters, leaving them paired up and with a gaggle of children to put on the train. The final words of the book and the series establish that Voldemort has not returned, and so all will be well. The epilogue caused a lot of controversy among some fans, but it does what it sets out to do by wrapping up what needs wrapping up. The book and the series wouldn’t feel as complete without it. The terse epilogues in Dragnet are another great example of wrapping up a story. Each episode concludes with a few lines about what happened to the criminal, leaving the audience feeling satisfied. I like using epilogues to wrap things up, and also to give some context to what’s been read. The epilogue in BROKEN is St. Val’s letter, which explains a few things and also in essence grants Penny her heart’s desire. The epilogue in FLY INTO FIRE has the characters gathering a year after the events of the main story, which draws a line under those events. There’s also a bit of symmetry there, one of the first scenes in the book takes place in the same location as the epilogue, and the coming together of the epilogue balances the destruction of the tower in the prologue. The epilogue of THE SPARK is all about glimpsing both the future and the past, and could also work as an endpoint for all three books. All of these epilogues, which are set outside the story, wrap up character storylines and establish that the world and the characters have moved on, though perhaps not unscathed. I can understand why folks might not be fans of prologues and epilogues. They can feel trite and unnecessary, especially if they’re long and drawn out. I think the best prologues and epilogues are short snippets. If they’re chapter-length, then I start to wonder why they aren’t just chapters! I do feel, though, that when they’re done right, prologues and epilogues add immeasurable value to a story. What do you think? For them? Against? Any favorite examples, either good or bad? 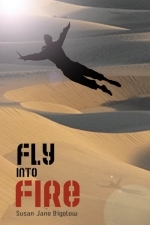 FLY INTO FIRE Release Day! 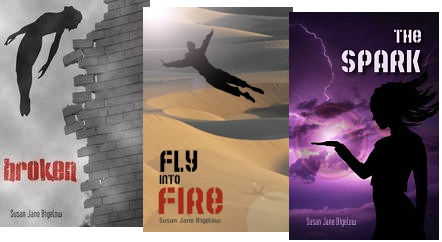 At last, the release day for FLY INTO FIRE is here! Please do add the book on Goodreads if you’re there! And if you feel like leaving reviews or ratings, positive or negative or somewhere in between, how awesome are you? I kind of can’t believe it. This book didn’t have nearly the gestation period that BROKEN did, it only took about three and a half years from start to finish compared to BROKEN’s six. Still, that’s some serious time that this book has been sitting around not being published, and here it is at last. I hope you all enjoy it! Thank you all for reading! And thank you for all your wonderful support this past year. I still can’t quite wrap my mind around the fact that yes, I write books and people read them. It’s what I’ve always wanted to do, and it’s just as amazing as I ever thought it would be. Stay tuned, there will be lots more from me this year and in the future! Some people, when they post to their dormant-ish blog after a lengthy time of not posting, get apologetic and make all kinds of excuses. Not here. I’m just going to pretend it never happened and continue on as normal! What’s been happening? 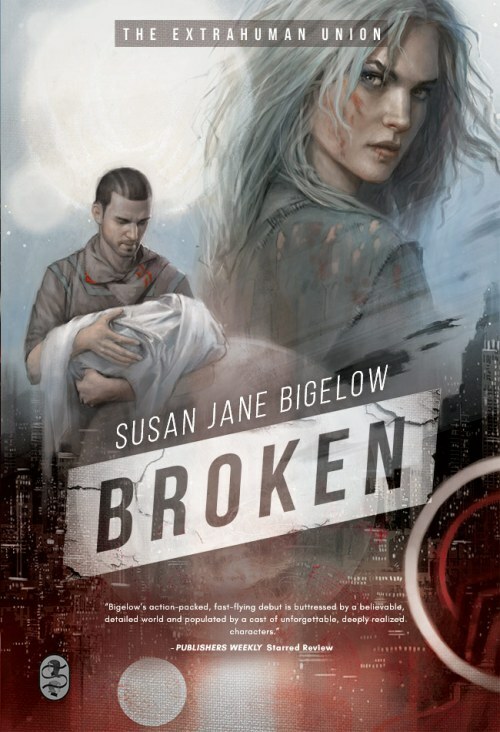 Well, next week (Nov. 22) BROKEN officially launches in print. Ha ha, I know! You bought your copy from Amazon like six weeks ago! This hasn’t been a release date that’s been paid a lot of heed. Oh well. Anyway, we had a launch party for the book at Modern Myths in Northampton on November 5th, and it was a blast! Candlemark & Gleam have the roundup, which includes a few pics. I did a reading from the book, which was amazing. I’ve never done anything quite like this before. Lucky for me, in about two months we get to do it all again. 2011 has been the Year of Constantly Rolling Out BROKEN, because we did the initial launch in e-book format only back in January, then launched the print version this fall. For the next book in the Extrahumans series, FLY INTO FIRE, we’re launching everything at once–and it’s all happening in late January! 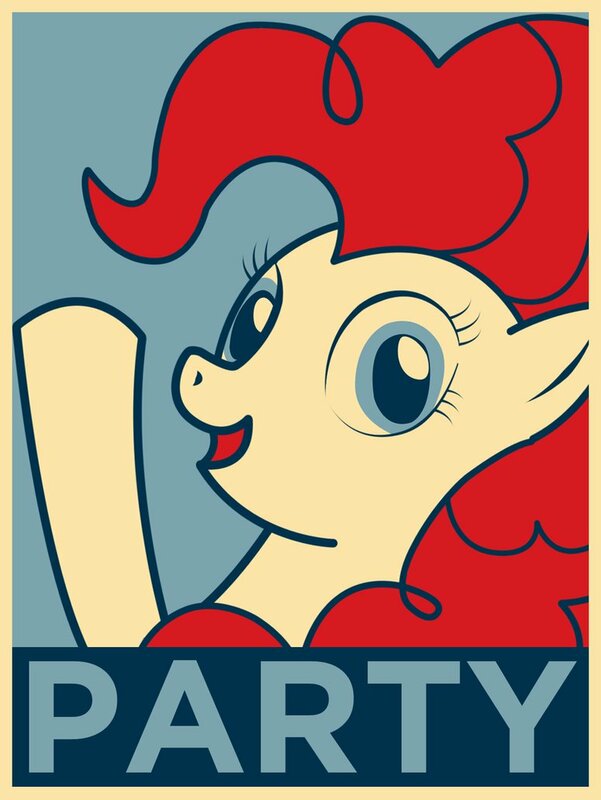 I think we may even be having another party. 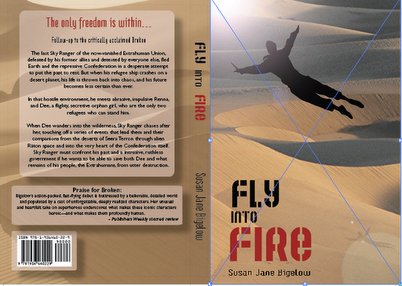 FLY INTO FIRE (EXTRAHUMANS #2): Done, ARCs are shipping out from publisher, launch set for January! I’m sure we’ll be doing pre-orders soon! Want to win a copy? There’s a contest up at Goodreads! THE SPARK (EXTRAHUMANS #3): I’ve sent this into my editor, and am waiting to hear about it. If all goes well, we may end up releasing this one sometime in late 2012. Stay tuned! THE DAUGHTER STAR (MARTA GRAYLINE #1): Also sent in to editor. But that’s all I know about it! I’m hoping this one sees the light of day, I think it’s a cool book with lots that readers will like. THE DEMON GIRL’S SONG: Somehow this title has stuck. I’m at 40,000 words on my first draft of the adventures of Andín dal Rovi and Lynde Shevariat, and I’m shooting to finish the draft by the end of the year. We’ll see. [NO TITLE YET] EXTRAHUMANS #4: I’ve made a start on this and have some very fun ideas. Haven’t cracked 10,000 words, so I’m still considering it to be in the very early stages. RED DAUGHTER (MARTA GRAYLINE #2): Planning is sort of done, and about 5,000 words and some opening scenes written. POLITICAL WRITING: Lots and lots and lots. Here’s the latest run of columns at CT News Junkie. Also, a short story! Really! Frog F**kery, a Stacy and Jazz Story, is up at 30pov. Sad to say, 30pov has gone on hiatus for a while, and I don’t know if they’re coming back. I’m working on other Stacy and Jazz stories, though, so never you fear! One of them involves some really rotten, mean and insulting eggs. That’s it for now. Check back in December, I’ll be doing guest posts in at least two places, so I’ll be sure to link to those!